Description: 112 eCall Router PSAP Modem and 3gpp Inband Modem Server decodes MSD/FDS (eCall Router Inband Router) and post the information to the enterprise level application platform. (E.g. Webservice, database, or application). Runs on Linux platform which supports both VOIP and ISDN calls. 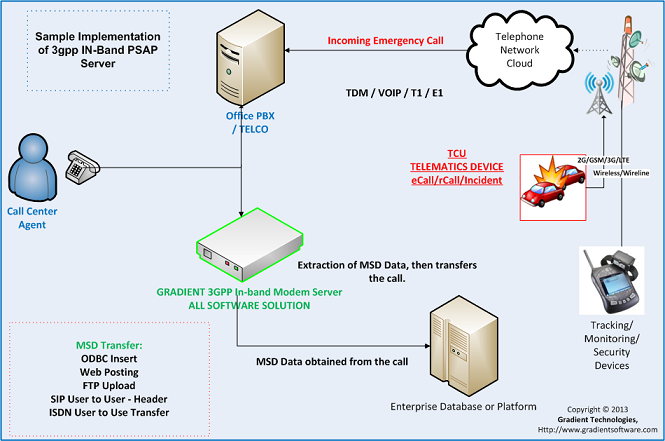 Gradient Technologies provide server software for the eCall in-band modem for the reliable transmission of MSD from an In-Vehicle System (IVS) to the Public Safety. Description: Full-featured, high-performance 123 Flash Chat can integrate db( Postnuke, phpbb, phpnuke, vbulletin, Invision...) It's text+ Video chat with customizable look, can be moderated and secure, AD banner& low port supported. Predefined messages stored. It offers easy installation on all major OS. It's a fast, affordable real-time chat. It's perfect for chat events, collaborative work sessions, online meetings, dating sites and customer live support. Description: 1st Email Address Spider is a professional targeted email extractor tool. With 1st Email Address Spider, you can easily and quickly set up your own business mailing lists. That is you have owned the powerful customers group and powerful competition over your business opponents. The 1st Email Address Spider is designed to collect email addresses matching your query. Description: 1st Email Address Verifier (EAV) is a program that verifies the validity of e-mail addresses in mailing lists.The program works on the same algorithm as ISP mail systems do. Mail servers addresses for specified address are extracted from DNS. The program tries to connect with found SMTP-servers and simulates sending a message, but does not send the message out. EAV disconnects as soon as mail server informs whether this address exist or not.